I haven't had the obligatory cat photo for quite awhile. I am calling this photo the March Miracle. My cats don't exactly like each other. The thing you need to know about his photo is that as much as I like my cats, I would not buy a sofa for them. One of my daughters ordered this for her first apartment thinking it was a full sized sofa. She gave it to the cats and they love it. I had a wonderful trip to the Dayton Knitting Guild on Monday to teach. My blog about the trip is on the TKGA.com website. If it isn't there yet, it will be soon. I didn't get many lessons to review this week but I had lots of emails with questions. Keep the questions coming. I am pretty good about responding immediately. This tip falls into the category of self-serving. I decided I wanted to do a tubular cast on for the Wine Dark Sea sweater. I am using Size 0 needles the crochet chain method didn't sound too appealing. I remembered the last time I did this with Redfish yarns I used Judy's Magic Cast On which I generally use for toe-up socks to do it. When you do a tubular cast on, most sources tell you to use smaller needles as the tubular cast on tends to stretch out. This isn't necessary if you use this method. The resulting cast on is much tighter than other methods I have used. (If you haven't used Judy's Magic Cast On you may want to check this previous posting: Judy's Magic Cast On). This photograph shows the cast on. 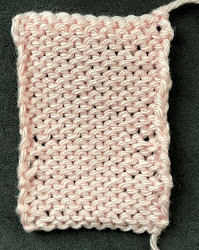 Most tubular cast on techniques require an even number of stitches so you have to do some manipulation after the cast on to get an uneven number. It is easy to do an uneven number of stitches with this cast on. You work two rounds as you would for the toe of a sock. Notice that there are 7 stitches on one needle and 6 on the other. Salon will be on Sunday from 1:30-3:20 and you know why it is on Sunday instead of Saturday! I am where I was when I decided to start over. I am MUCH happier with the design. Thank you very much for your very interesting information. I like to use tubular cast on but I don't know to cast on with this method for a knit working in round. Do you know how to tubular cast on in round ? Have a Nice day and week !